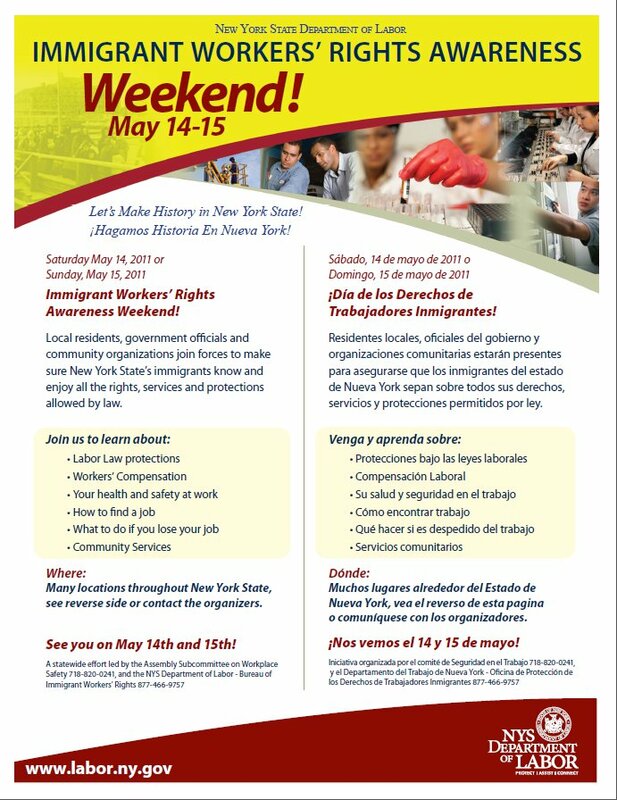 The NY State Department of Labor is inviting the community to participate in the first Immigrants Rights Awareness Weekend this May 14-15 with many events planned at about 70 locations thru the state. In Syracuse, assemblyman Sam Roberts will be hosting an informational table at the CNY Regional Market, 2100 Park St. Syracuse, NY and members of the Workers’ Center will be supporting this important outreach event. In addition we are collaborating with “Nosotros, Your Latino Voice” radio program to broadcast information about immigrant workers rights on Saturday, May 14 starting at 3:00 pm on 95.3 FM Radio Love. Immigrant and refugees are very often the victims of unscrupulous employers who take advantage of their vulnerability because of language and cultural barriers, lack of knowledge about their rights and labor laws or their distrust of government because of their immigration status or past experiences with government agencies. Today we attended a roundtable organized by the Bureau of Immigrant Workers Rights of the NY State Labor Department at the West Side LEarning Center, there many advocates, adult students and representatives of organizations that work with immigrants and refugees in CNY were asked to share their experiences with the NY State DOL as well as their observations about their effectiveness to connect and serve these populations. We have had in the past the experience of having difficulty contacting the local office of the NY State DOL as their answering machine is very ineffective in serving immigrants with limited English skills. At this meeting it was shared that language access is a priority for the agency and we hope that this issue will be taken on as not everyone has access to a computer to access their services or feel comfortable visiting the NY State DOL offices. We are looking forward to making accessibility for all workers to the services of the NY State DOL a reality.